Chong An Sunim first visited OZS on September 21, 22,23 2018. We had a wonderful Dharma Talk Friday evening September 21, 2018 and then continued Saturday and Sunday with a workshop/retreat, starting with an “Eye Opening” & Buddha Hall Dedication Ceremony for our new Zendo space on Saturday and a Buddhist precepts ceremony at the end of the workshop Sunday. There were also opportunities for kong-an interviews with Chong An Sunim. Chong An Sunim started Zen practice in 1990, in his birth place Budapest, Hungary. He became a monk in 1994, and spent the next six years training under the guidance of Zen Master Seung Sahn at the Seoul International Zen Center, Hwa Gye Sa, Korea. He was given the title ‘Dharma Master’ and thus became authorized to teach in August, 1999, by his teacher, the late Zen Master Seung Sahn. 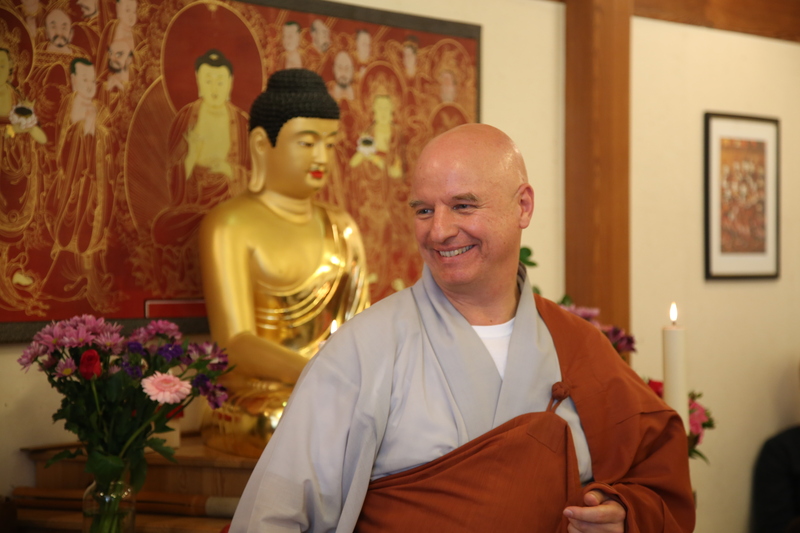 Since 2000, his teaching activity has extended to Asia, United States and Europe. He initiated the search for land in 2003 to construct a traditional Korean temple in the Pilis Mountains, near the capital of Hungary, Budapest. As part of the monastic and lay tradition of Korean Buddhism, it is intended as a practicing place and residence for all people who want to do extensive training as well as short term retreats. The temple site was found in 2004 September, and the first piece of land was purchased in 2005 February. The construction of the main temple building was started in 2006 ceremonially, and a year later physically. Since 2008, we have been having yearly winter retreats for 90 days, and by now our retreat schedule is full of short, medium and long term retreats. Basic teachings of Buddhism and Zen. What is mindlessness, mindfulness and the perception that everything is created by mind alone? What are the Taoist elements in Zen? What does it mean that we return to our true nature? First Enlightenment, original Enlightenment and final Enlightenment. Why do we practice until all beings get Enlightenment? A brief account on karma. Conditioned existence and identification. Habit-force and direction. Functions of our consciousness and the soul. The cycle of life and death. The law of karma. How does karma appear and disappear? The synergy of western and eastern way of viewing and treating our traumas, our karma overall. The problem of loneliness in the west — can we treat it if we just do not think about it? Can we get rid of it if you don’t do anything? The Zen circle as the symbol of progress on the path.